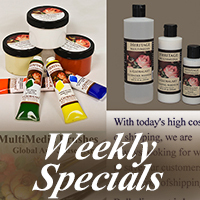 Special Pricing ends this week! Registration is at a special price until January 18th. This is our ultimate color theory course. You have lifetime access to the material and we will continue to update and add to the class all year and into the future. This year, we will build more than 100 hours of video lectures. 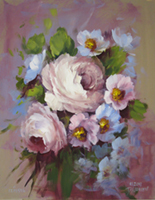 David will demonstrate 40 painting exercises with flowers, landscapes, scrolls, wildlife and more. There are no time limits and you never have to worry about lost lessons. All lessons and materials can be download or streamed. These paintings use 1 red, 1 blue, 1 yellow, & white. In addition, S201 online students receive a 35% discount on Heritage paint for the entire year. 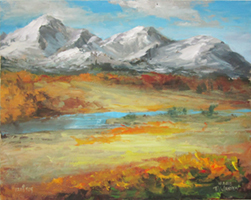 The S201 students are invited to the Sidney Fine Arts Center, in September 2019, for a free week of applied color theory studies. Bring your questions to a live class. We hope to see you in this year's colorful adventure!